Here we see Jace losing it, unable to cope with the emotional attachment he has to Clary and he draws a very thin line between the fight and near suicide. 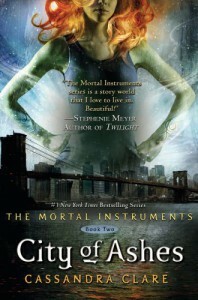 I love the break down he has and how cassandra clare paints such vivid pictures and now we have Simon in the mix. Clary's best friend and he hopes some day soon boyfriend. She can draw not only emotional scenes but fight scenes as well. The only little niggle I have is you can already see the main so called twist but it didn't stop me reading this for the 1st time in two days.